This month we’re trying something different on our blog: Excerpts from our books. We’re still working on the design and format, so since I’m the first one up I thought I’d just pick a topic. The most suitable one for opening up a new topic is Favorite Openers. I have several favorites but most of them are a it too long for this purpose. So I thought of LADY WICKED because I like the way this little piece ends. He’d have to marry the richest heiress in England if he meant to salvage this crumbling pile of rocks. Turning about in the flagstone courtyard of the long-deserted hall, Thomas Loudon Steynes, Viscount Savoury, surveyed the wreckage of time and realized how badly he had deluded himself. He was not usually a man to laugh aloud, but, standing among ruins as worthless as his corrupt soul and impoverished pocket, this time he did. God would not create an heiress foolish enough to accept the Savoury heir and his decrepit inheritance. His intention to make himself over into a country gentleman was equally as hopeless. But Savoury had run out of options. So, sneering at himself, he swung into the saddle of his grey gelding and rode out through the gatehouse to accomplish the impossible anyway. What else, after all, did he have to do with his life? Descending off the rise, Savoury crossed the stone bridge into the blanket of chilly fog and followed a puddled lane toward Lower Steyner. As he neared the village, the sound of voices, like a child’s counting rhyme, floated through the still air. He stiffened in his saddle, his ears straining at the strange sound. 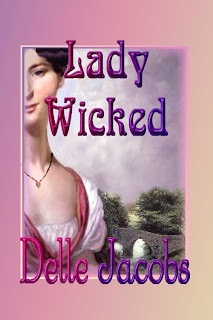 “Lady Wicked, Lady Wicked. . .” The singsong words drifted, broken, through the fog. How odd. He must be hearing it wrong. The sound dissolved to a muddle again. Savoury nudged Orion to pick up the pace. Rounding the bend approaching the village, he spotted a group of boys hopping about like marionettes, jeering a woman in a green pelisse, who walked toward the village, her bonneted head held high. The hairs on Savoury’s neck bristled. Peasants did not wear pelisses. But surely they did not dare harass a gentlewoman. He rode closer. So intent were the urchins in their game of mocking, the clopping of Orion’s hooves went unnoticed. The lady kept walking, her body, posture, even her large straw bonnet, pointed toward the lane before her. One gangly boy scooped up a lump of mud. She ducked as he pitched, but the clod caught her in the chest. Her market basket fell and she bent to retrieve it. Screeching gleefully, two smaller boys joined in, pelting her with clods and sticks. Devil it! Savoury spurred his horse, shouting as he rode down on the ragged little mob. The rascals squealed and scattered, heels flying. A smaller boy wavered between fighting and fleeing. With a wild swing, he lobbed his rock, then bolted. As the rock struck her head, the woman cried out, staggered back, then crumpled to the lane like a discarded nightshirt. She lay still, her bonnet twisted over her face. Dark hair tumbled and splayed over shoulders and dirt. “Little demons!” Savoury shouted. His heart pounding, he leapt down from Orion, ran the last few steps and dropped to his knees beside the limp figure. Green eyes blinked suddenly wide, as if he had shoved hartshorn beneath her nose. Bedamned if he hadn’t rescued his own nemesis. This story is not currently available, but I promise to rectify that problem very soon. In the meantime, bot APHRODITE’S BREW and SINS OF THE HEART are available through Samhain, Amazon, and I believe Powell’s will have them at the booksigning in September. I’m trying to fix that, Genene! It’s my favorite book. It needs to be published! Happy Labor Day! I nominated this site for a Kreativ Award. Keep up the good work! That’s cool, Sallie! Since I’m still “on” until the next autor’s turn, let me say thank you for the group!